What else can be said? The economy is on the move. The BWEI® made a material move to the North this month, and much of that was based on quarterly reviews of the twelve and twenty-four month trends which are more heavily weighted when calculating the index value. An upgrade of the ADP 1-year trend from -.5 to .5 was particularly impactful. Within the Consumer Major Category, the TD Ameritrade IMX demanded trend upgrades as did Investor Confidence, while the Bloomberg Consumer Comfort Index set a monthly average record high. We continue to feel the momentum is real but fragile and subject to political, economic, and policy risk, not the least of which is an apparent bias toward prophylactic rate increases in anticipation of inflation. The Hawks need to stand down for a while and let this thing develop. Uncertainty about the outcome of investigations is causing hesitancy as the world frets about whether the guy whose policies sparked the move will make it through a full term. There was a great deal of anticipation regarding the Employment Cost Index report that came out Wednesday morning, but we don’t know why. This is a quarterly report which won’t take the effects of the post-tax reform wage increases into effect until Q2 of 2018. In spite of that, one can hallucinate a slightly positive trend developing already. Matt talked about the impact of tax reform on WBBM’s Noon Business Hour in Chicago on January 11th. You can follow the link, scroll down to the 11th and Matt starts at 2:20 into the podcast. The index advanced .06 to .18 (rounded) from .11. That ties the all-time record high set in September of 2014. Employment, Inflation and Services remain painted in red ink where Employment showed material improvement, Inflation retreated fractionally, and Services were still stubbornly unchanged. Consumer, General Measures, Manufacturing, Retail, and Real Estate are positive where all padded their leads except Manufacturing and Retail, which showed fractional slips. The Manufacturing pullback was actually welcome as the Fed sub-group surveys came back down to solid yet sustainable levels of strength. ADP was huge Wednesday morning. Let’s see if it translates to the BLS out this Friday the 2nd of February. The Blue World Jobs Report Analysis will be out before noon Friday. See you there and have a great month! And with that, the 2017 employment data is in the books! How was it? As usual, it depends on which “experts” we’re listening to. If political…which side? If cubical denizen economists…which side? If media…which side? If financial industry…which side? And if Krugman…well, Paul, ahhhhhhhh, Paul! But if you’re listening to Blue World, who couldn’t care less about spinning the results, and you’re strictly focused on how the labor picture reconciles with what you see from the level of your real business that employs real people every day and want to make strategic decisions based on unbiased data analysis, then “How was it?” doesn’t depend on anything other than “How it was!” So, all that said, how was it? A very solid “mixed”…but leaning forward. Let’s dig into it. We won’t spend a lot of time on December 2017 because it fits well with the rest of the year. We’ll just call it mixed, like all of 2017, and point out the positives are the Labor Force and total Employed rose, while total Unemployed fell. The Diffusion Indices for the total Private Sector as well as Manufacturing remained comfortably in the expansion range well above 60. On the down side, the Participation Rate remains below 63%, and the Not in Labor Force totals, while showing some sign of flattening earlier in the year, continue to creep upward. That is probably the biggest disappointment of 2017. To the extent the Employment Situation report is both forward and lagging, there is value in comparison. We always say, “One report unto itself is meaningless. It is the trend that matters.” With that in mind, the table above compares selected key data sets we use to analyze the reports month in and month out. Included are 2015, 2016, 2017, and the first and second six months of 2017. Some of the data is significantly improved and headed the right direction, while some is not as exciting, but we will say if the positives keep moving in their current trajectories they will pull the others along. We were just hoping to see that phenomenon develop during 2017. 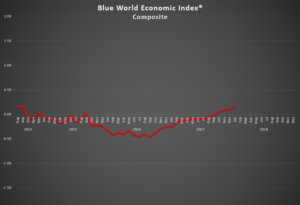 We did not get the Blue World Economic Index® posted this month, but we can tell you it advanced further into positive territory, ending at .11. The index continued to climb all year and averaged a -.06 for 2017 vs -.11 and -.37 for 2015 and 2016, respectively so there is NO question the economy is moving. The biggest problem we see for 2018 is a Fed that seems hell-bent on raising rates in the absence of any consistent inflationary pressure. We’ll be watching that closely in the coming year and, of course, let’s keep close eye on the portfolios as the markets continue to ignore past record highs in favor of new ones. If you want some ideas on safety nets, give us a shout. Have a wonderful and profitable 2018 and we’ll see you back here at the end of January.